Brother Warren told me that during his debate with Mr. Flew he walked over to his table and saw that Mr. Flew had a copy of brother Warren’s book entitled, Have Atheists Proved There Is No God? Brother Warren said that the book was very worn around the edges indicating that Mr. Flew had used it much in his studying. 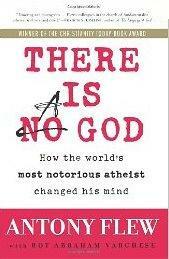 Mr. Flew’s change is a devastating blow to atheism. He is to be congratulated and commended for his change. He now needs to learn the identity of the God of the Bible, and obey Him and become a Christian. — Garland Elkins, “A Renowned Atheist Renounces Atheism,” Yokefellow, Vol. 32, No. 1, January 2005, p. 2. Second, one will not agree with everything written in Flew’s book, but it is very valuable as will be observed. Third, be aware that while Flew did change his mind about the existence of God, he remained unchanged about his rejection of an afterlife—also called a “mortalist”. Tragic as that is, this provides an important point—he did not make a “deathbed confession or conversion” as some of his atheist associates attempted to excuse or deflect his change with. Tragically, he ran out of time to either recognize or accept the truth on matters pertaining to the afterlife. Sadly, he remained a “mortalist” until April 8, 2010 when he passed away. There are several important matters Flew brings to light in this book that are worth reflecting on. Also in the appendix is a critique of some of popular atheists of today by Roy Abraham Varghese who assisted Flew with the writing of this book. Or as others have so argued—where there is design, there must be a designer that is at least equal to or greater than the design. This admission by Flew is interesting since in his debate with Warren he attempted to skirt arguments from biology pressed by Warren since he was not a biologist.